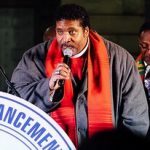 Several political leaders and activists from the civil rights movement commemorated Bloody Sunday in Selma Alabama Sunday with a Jubilee and a march across the Edmond Pettis Bridge. Before the commemorative march across the bridge Rev. Dr. William Barber spoke about the state of civil rights today in front of Browns Chapel where the original march in 1965 started from. KBCS’s Ruth Bly was there with Project Pilgrimage.